The Region of Tuscany Health Department was included as an associated member in WP7 “Healthcare” of the European Partnership for Action Against Cancer (EPAAC), initiated by the EU Commission in 2009. The principal aim was to map centres across Europe prioritizing those that provide public health services and operating within the national health system in integrative oncology (IO). A cross-sectional descriptive survey design was used to collect data. A questionnaire was elaborated concerning integrative oncology therapies to be administered to all the national health system oncology centres or hospitals in each European country. These institutes were identified by convenience sampling, searching on oncology websites and forums. The official websites of these structures were analysed to obtain more information about their activities and contacts. Information was received from 123 (52.1 %) out of the 236 centres contacted until 31 December 2013. Forty-seven out of 99 responding centres meeting inclusion criteria (47.5 %) provided integrative oncology treatments, 24 from Italy and 23 from other European countries. The number of patients seen per year was on average 301.2 ± 337. Among the centres providing these kinds of therapies, 33 (70.2 %) use fixed protocols and 35 (74.5 %) use systems for the evaluation of results. Thirty-two centres (68.1 %) had research in progress or carried out until the deadline of the survey. 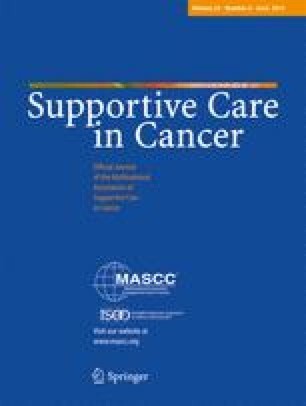 The complementary and alternative medicines (CAMs) more frequently provided to cancer patients were acupuncture 26 (55.3 %), homeopathy 19 (40.4 %), herbal medicine 18 (38.3 %) and traditional Chinese medicine 17 (36.2 %); anthroposophic medicine 10 (21.3 %); homotoxicology 6 (12.8 %); and other therapies 30 (63.8 %). Treatments are mainly directed to reduce adverse reactions to chemo-radiotherapy (23.9 %), in particular nausea and vomiting (13.4 %) and leucopenia (5 %). The CAMs were also used to reduce pain and fatigue (10.9 %), to reduce side effects of iatrogenic menopause (8.8 %) and to improve anxiety and depression (5.9 %), gastrointestinal disorders (5 %), sleep disturbances and neuropathy (3.8 %). This publication arises from the European Partnership for Action Against Cancer (EPAAC), which has received funding from the European Union through the Executive Agency for Health and Consumers of the European Commission, in the framework of the Health Programme 2008–2013. The European Commission is not responsible for the content of this publication and has had no role in the elaboration or the writing process of the document. We would like to acknowledge and thank the following people for their contribution to this work: Emanuela Portalupi and Paolo Fedi; Laura Cignoni for her support in the English translation; and José Maria Borras Andres and Joan Lluís Prades Perez and all the associated and collaborating members of EPAAC for their collaboration. The authors declare that they have no competing interests. All the costs for this study were supported by the European Union and the Tuscany Region.